Hotel booking is refundable according to the cancellation policy as stated in the hotel booking voucher. *Note : For Singapore to Tioman Island route, customer can only book 2 ways. 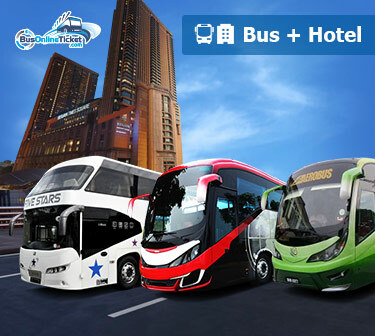 BusOnlineTicket.com is the only online booking portal in Malaysia & Singapore to provide Bus + Hotel booking service. We intent to make trip planning easy by offering Bus + Hotel booking service where you can book bus tickets and hotel together instead of separately. How to Make Bus Booking and Hotel Booking Together? Making bus booking and hotel booking together online is easy and you get to save more time. First, choose your origin, destination, bus departure, return date and specify the number of passengers. Proceed to search for the available bus trips and hotel. We will present you with varieties of choices for bus operators and the hotels available for booking. Choose the bus trips and hotel that suits you and proceed to the payment page. In payment page, you just need to fill in the required information, choose a payment option and proceed to make the payment. We will send you the booking confirmation to your email after a successful payment within 24 hours. Booking bus ticket online together with the hotel at BusOnlineTicket.com gives you the best hotel options in your destinations. The hotels that we offer are well-known with good reputations and popular among the visitors. For bus to Mersing, you can book Berjaya Tioman Resort in Tioman Island. 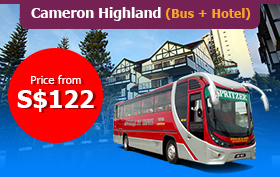 If you are going to Cameron Highlands, we have many hotels including Copthorne Hotel available for online booking. Meanwhile, Bayview Hotel is a great choice if you are taking bus to Malacca. Cititel Express hotel is also a famous hotel that we offer when you take bus to Penang. 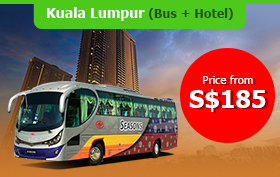 Enjoy greater convenience when you book bus ticket Malaysia online with hotel at BusOnlineTicket.com. 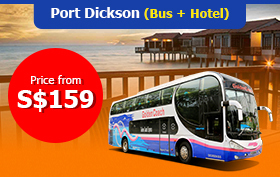 Bus booking for Singapore trips is also possible at our website. You can choose from many hotels we offer such as Hotel 81, Value Hotel and Marina Bay Sands when you book bus to Singapore with us. For this special Bus + Hotel offer, bus to Singapore is available from Kuala Lumpur, Penang and Malacca. BusOnlineTicket.com let you book bus ticket online from top bus operators including Transtar, KKKL, Grassland Express and more. Book Bus + Hotel at BusOnlineTicket.com today!